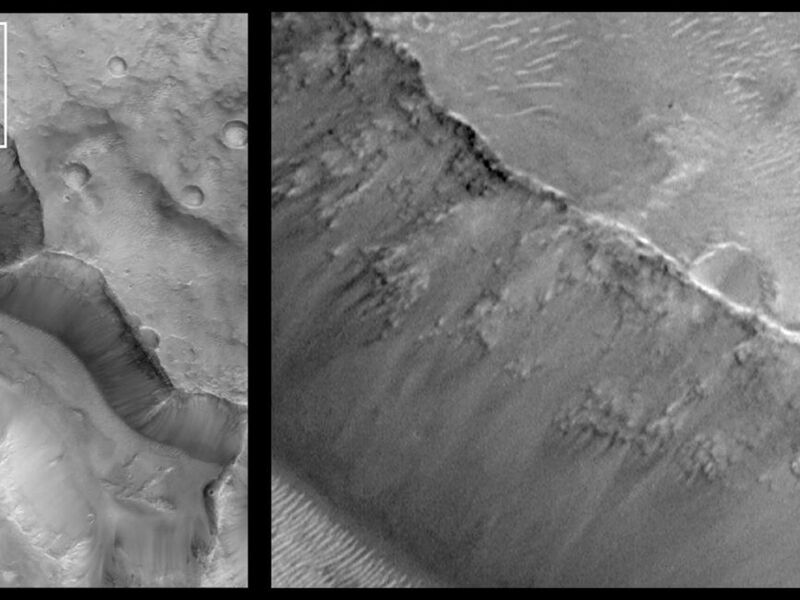 Mars Orbiter Camera (MOC) images of the Valles Marineris chasm walls obtained early in the Mars Global Surveyor (MGS) mission demonstrated that the upper martian crust--at least in the location of the Valles Marineris--is layered down to depths of several kilometers/miles. 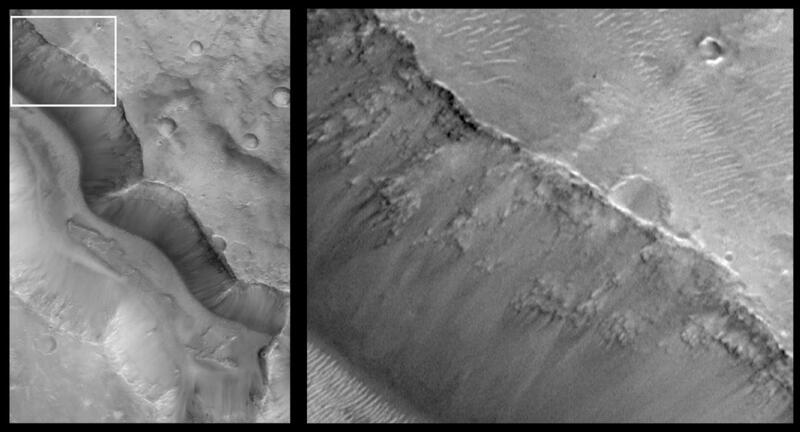 Over the past year, examination of additional MGS MOC images of other parts of Mars--including the vast, heavily cratered terrains of the red planet--also exhibit a layered crust. On Earth, geologists use the composition, texture, and sequence of layered rocks to decipher clues about the planet's history. Mars might offer a similar opportunity. Shown here is a picture of Tagus Vallis in the martian southern hemisphere. 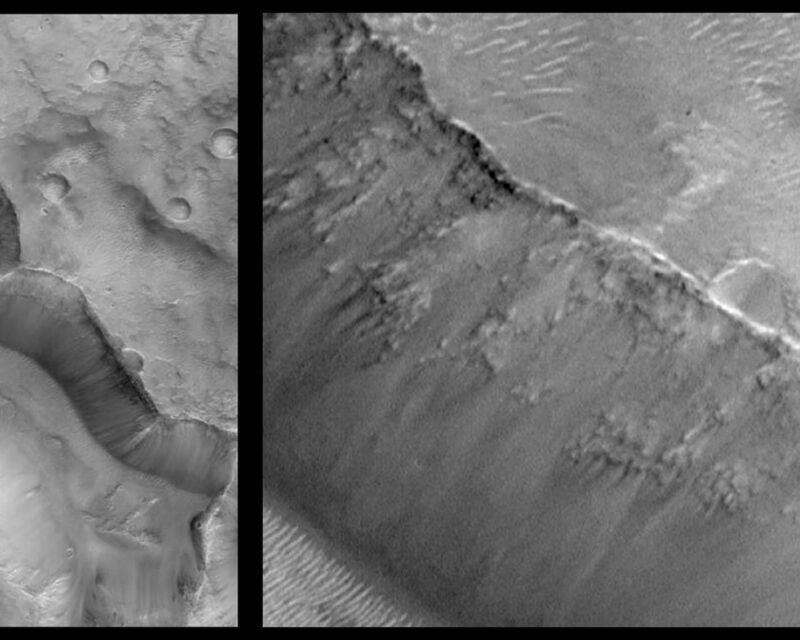 The picture on the left shows this valley in a view that is about 7 kilometers (4.4 miles) wide by 11 kilometers (6.8 miles) high. Tagus Vallis is the deep, steep-walled valley that runs almost diagonally from upper left to lower right. The white box shows the location of the magnified view of the valley walls on the right. 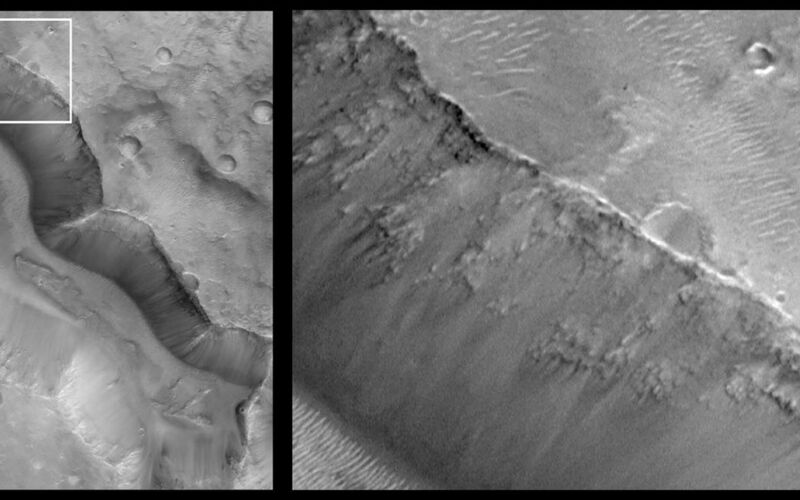 Layered rock can be seen, exposed in the upper slopes of the valley. Bright sand dunes are visible on the valley floor (lower left) and on the upland plain (upper right). In this picture, the illumination is from the upper right. This image was obtained in April 1998 during the MGS Science Phasing Orbits imaging campaign. This result was presented at the 30th Lunar and Planetary Science Conference in Houston,Texas, March 1999.